TankAndBarrel.com is a family owned and operated business division under Infinity Online Marketplace, LLC. We are located in St. Peters, Missouri, United States of America. We are an authorized dealer for all of our tank and barrel manufacturing partners. We have the ability to sell all of our products at a greatly reduced price due to the fact that we keep our overhead costs to a minimum and our products ship direct from the manufacturer to you, eliminating the need for us to maintain a large storage facility! Shop around, you'll see that TankAndBarrel.com has the lowest prices in the business. Reputation. We have an A+ rating with the Better Business Bureau (BBB) and we will do everything we can to maintain that high standard. Feel free to click the BBB link below to view our accreditation. Lowest prices. If you visit any other store with a better price, simply contact us and we will do our best to beat it. Customer service. From selecting your items and checking out, to the shipment and delivery of your product, our support staff will be there every step of the way! Selection. Over 2000 products and growing! Warranty. All of our products carry a manufacturer's warranty. Quality. Our manufacturers are the best in the business and quality is their number one goal. We are very selective in seeking the highest quality products. Family Owned. We completely understand what it is like to be on the "buying" end, and we will do everything in our power to make your experience a pleasant one. When you contact us for help, you will never be given the run around, you will never be placed on hold, and your emails will be answered in hours... not days. If for some reason we do not immediately have the answer, we will contact the manufacturer directly to find an answer to your question! Privacy & Security. Your privacy and security is of utmost importance to us. We do not store your credit card information on our servers and all of our transactions are securely encrypted. The only emails you will receive from us are in regards to order status. We do not give out any of your information to third parties. 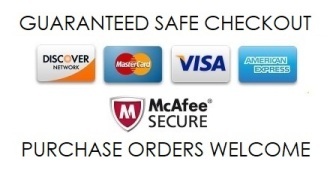 Our website and server is scanned daily by McAfee and is a listed as a Certified McAfee Secure website. Enjoy your stay and if you have any questions at all please do not hesitate to contact our support staff.